‘shabby chinese’ . . .
She wrote that her daughter had characterized her as being either a “princess” with lots of flowers and sparkle, or the other extreme of “refugee-immigrant” with stark neutral colors and a kind of shabby look. I really identify with the “refugee-immigrant” look because (I guess I am one–the immigrant part, not the refugee part) and find myself dressing often in drab colors: my favorite color is taupe, believe it or not–a hard color to find when it’s just right. 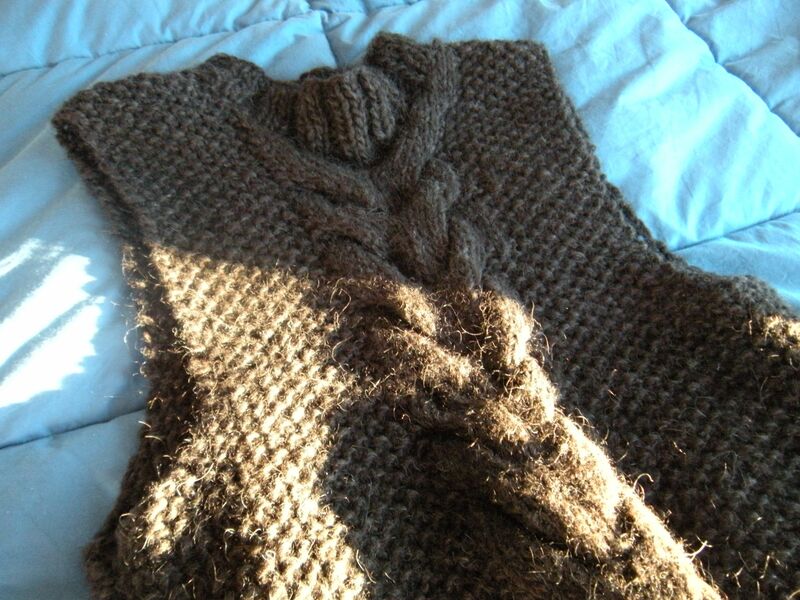 Anyhow, my brown vest is kind of along those lines and I especially like the way the armhole edging is raw seed stitch and that it curves in slightly. I am planning to knit more of these but am thinking of cropping the sweater slightly and knitting it in different gauges of yarn. First, though, I’m waiting for some yarn to arrive from WEBS in a ‘peat’ color to knit a replica of a brown sweater for M. that I wore all the time when my kids were growing up. It is an iconic sweater memory for all of us. 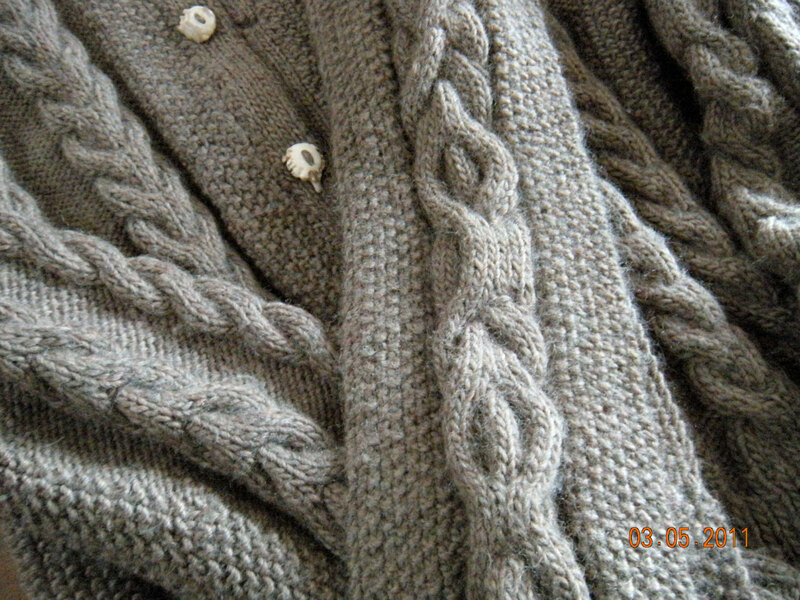 I’ve knitted a variation before in a heavier alpaca yarn along with a deconstructed meandering cable. All these knitting projects crowd in on me as I read weaving books about how to set up a warp. Honestly, it seems really tedious to me so maybe saori weaving will continue to be a fantasy in my mind’s eye, a romantic notion that I would be sitting erect with flowing long hair at a beautiful wooden floor loom, weaving my way into the sunset. Instead, the reality may be closer to my shabby chinese aesthetic, sitting on the worn butterscotch leather couch that I found on Craigslist, knitting taupe and warm brown sweaters in staghorn cable and seed stitch, growing my hair out and wearing it parted similar to when I was in my thirties, cooking macrobiotic asian dishes with brown rice and watching DVD dramas like “Homeland” at night with G.
Beautiful sweaters, beautiful yarn, perfectly knit! I love colors but tend to pick black, navy blue or grey in colors for my clothes – taupe is just such a pleasing, neutral color so I know why you pick it! Thanks, Beth! Do you knit too? I do but not as well as you! I’m a crocheter since childhood, and have recently come to love knitting.